ok, everyone need advice on my kitchen floor. I just installed Handscraped wide plank hardwood floor in our living room and hallway. I want to install the same wood in the kitchen, which connects to the other areas. And I do have my concern's with any type of water, so everyone advise me. Thanks. in my opinion it would be far to slippery for the kitchen, best to go with a linoleum, with a texture, if sometying is spilled it will be very dangerous! Would love to see a pic of your floors . . . we want to do ours and are looking at doing something that isn't too costly. 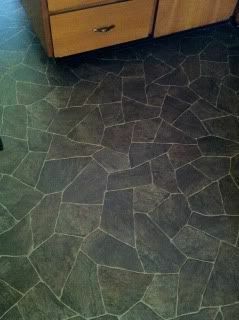 We installed a European vinyl that looks like blue/gray slate cobble stone and wider than American, so no seam - love it. I have bamboo flooring in my kitchen. Just recently we had an issue with our freezer drain getting clogged and water spilled onto the floor. There was not an issue with warped wood; mind you, we cleaned it up fairly quickly. Also, there are always spills from kids washing hands, or me washing dishes, and no problems. I wouldn't advise leaving water to sit on any wood product, and like Stacy above said, if you wipe it up it should be fine. I usually just toss the latest kitchen towel on the floor, sop it up and move on to the next one. I would do it with certain types of wood, just check with the stores flooring expert. I would love wood floors any where! Just hope no water gets on it when you're not there. I just installed porcelin in my kitchen and have NO worries! Thanks everyone. The floor is not slippery at all. I love it ,everyone that has seen it thinks I paid a millon dollars for it. (lumber Liqadators). I will NEVER do a carpet again. I also think I'll be fine in the kitchen. I took A piece of left over wood and put water on it & left there for 8 hours and it never soaked in the wood. Maybe I'll try and soak it in water and see what happens. I think they would be wonderful for you. They are soft on the bare foot and are quite tough. No cleats, but othe then that, they'll take it. If your a clean freak then I would try to change you ways and only mop them a couple times a month. Hands and knees and keep the cloth as dry as you can... The great thing about wood is you can refinish it, so it should last a life time! I've had two friends in the last 6 months with unseen leaks (one from the dishwasher the other the ice maker) under cabinets on the hardwood floors. Much damage and costly to rip out the cabinets to replace the flooring...it sure has made me re-think putting wood in the kitchen. My hub installed ours during the OJ trial. Love it! Just had it re-done this past week. Would post a pic on here if I knew how. We had replaced the linoleum a couple times, that stuff just does not hold up. Hardwood is fantastic. We had been using an old mop for cleaning it, which I hated. Then we got a "steam" type and my hub loved it, but the guy who re-did our floors said not to use water, so he got a cleaner for hardwood floors for a very good price. This stuff they used on the floors should last 15 years (maybe I will be still around then). My hub chose a non-shiny coating, after talking to several people who had theirs done. It looks a little odd, since we had always had it shiny before, but who cares. I'm happy to have it done, knowing it will last a very long time, even tho I am worse than a six-year old about spilling or slopping something. Carol C. I have porcelin myself (20 years). If I ever had to do again, it wouldn't be porcelin. I have fallen numerous times, once took me to the ER, if i would have been an inch closer to the counter I wouldn't be typing this today. I regret it yearly, I have it in my vestible, forey and kitchen, the vestible and kitchen are the worst, both of which have potential of getting wet and that is what did it everytime! I can not wear shoes in either area, if you start to slip at least barefoot you can get a grip. All I can say is be very careful, it happens quick! PS I am not that old either! I have hardwood floors in my kitchen and love them. I have had no problems. Virginia, I did the same water experiment with a laminate sample. Haha. We installed hardwood in our kitchen. Sure we have some scratches from chairs and dings from dropped silverware but if you can live with minor imperfections I say go for it. Just wipe up water asap and as far as leaks go we had an issue with our dishwasher whereby it leaked ever so often onto the floor. We had this fixed but there were no issues with the hardwood buckling. The best flooring for a kitchen is tile, Just pick a color that blends well with the wood. Yes you can poly over wood to protect it but you cant seal it off totally and if theres a way water will get in. I refinished my first hardwood floor back in 1983...The FACT of the matter is wood in kitchens is far less robust than tile. Kitchens see the highest traffic of any room in the house, add in leaking sinks, ice makers, dishwashers etc. and it is a recipe for failure. not so much if but when. I have done dozens of repairs to kitchen floor due to minor leaks where the floors buckled and required to be ripped out. In most cases these leaks are the minor ones that go undetected for days or weeks before the damage is noticed. By then it is too late, catastrophic leaks that happen due to a burst pipe can cause extensive damage as well but in most cases like that, home owners insurance can help. I have never been called in to fix tile from a leak. If you want the look but not the work, add a little tile to the work area especially under your baking table or whatever work space you have, be creative with. The tile I did on the floor matches the tile I did on the countertops. Its not the water on top of the floor its what goes between and under it. If you have wood on top of a sub floor the water will totally ruin it. Our hardwood floors are actually our sub floor (1943). If water goes in between it goes completely thru to the concrete 6 inches below it. Its Heart Pine. Try taking a sample of your wood and immerse it in water for a while. Then take it out and let it dry, see what happens. BIG fan of hardwoods in the kitchen! (own it myself) Its not as hard on your feet and it takes quite the beating in my house with pets and my abundance of time cooking for my family. I realize there is risk IF there is a leak (which .... pardon me while I knock on that wood!)... but we have been fortunate to not have had one in 20 years. Esthetically speaking? Its often the best choice too! I think hardwoods are beautiful, and when you have the opportunity to carry one floor material throughout your floor plan it gives continuity and flow to the space. Donna D...I hate to burst your bubble on "killing germs" but a quick pass does not do squat in terms of killing germs. Before I changed careers I worked for a dozen years in the biotech (large scale pharmaceutical manufacturing) Industry. One of my areas of expertise was in "sterile" systems. I was the system owner for all of the autoclaves. To achieve "kill" levels you need steam at pressure ...about 250 degrees F or 121 degrees C for about 4 minutes. There is not a single floor steam cleaner that can achieve these temps or pressures. Think about "boiling" water to make it safe to drink...the standard recommendation is 10 minutes of Boil. Boiling will never exceed 212 degrees F....and where I live at 8500 feet water boils at a much lower temp. Sadly the manufactures of these machines prey on people's perceptions of "clean" and claim many false truths. Fear and hype have also sold countless varieties of "antibacterial" soaps and cleaners which in fact actually cause the bacterial to be more resistant. white socks are good....LOL....I'm more of a slippers kind of guy...I can go outside (in the snow) to get firewood 8 or 9 months of the year in them. Sheen will effect how easy it is to keep clean...I would go with a sheen that matches the rest of the trim. The normal rule of thumb is trim goes one step shinier than the walls...ie: Egg shell wall = satin trim As far as the "sticking" the paint will need to be fully cured before use...the common mistake it to use stuff too early before the paint is fully hardened. In most of my woodworking projects I wait a week or two before I do the final finish "rub out"...and that is form me in the arid west...east coast humidity can slow that down even more. Silicone is the "death sentence" for wood floors when it come time to re-finish. It is the leading cause of "finish failures". Silicone residues create what is know in the trade as "fish eyes".